This reading was done for a very beloved pet belonging to a client of mine. I was so very honoured and touched to be a part of the loving and soul-touching connection between a pet and her owner. I look upon my own pets as my children in a way, yet I also do my very best to give them the freedom to be wild and true to their own animal nature. I treat our connection as a bond between soul-friends, friends that I hope to be reunited with when I cross over to the Other Side. 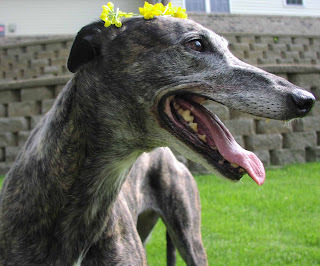 My Client's Initial Request: I am partnered in this life with a sweet, loving greyhound named Annie (Annie the Serene Queen). Three weeks ago she was diagnosed with invasive fibrosarcoma. She has a fist-sized tumor on her left hip that is inoperable given the fact that she is a 12 1/2 year old who would not tolerate the wide excision and probable left leg and partial pelvis amputation that might slow the destruction. I won't put her through that at this stage in her life. She does have a wonderful holistic vet and, in addition to pain medication, has prescribed a custom Chinese herbal formula, Chinese dietary therapy and an acupressure point recommendation. I am following that, spending time outdoors (as the evolving spring will allow) and giving lots of good rubs and tons of kisses. My expectation is not "healing", as in cure...but "healing" as in opening our hearts to their full potential to accept our destiny and to be filled with the grace, love, appreciation and acceptance of and for the time we have shared and will, hopefully, share again. My hope would be that she could experience peace of mind and body..release of her anxiety and discomfort..and be able to live the best life that she can have until she departs for the Rainbow Bridge. I want her to be able to feel my deep love and respect for her. I want her to not worry about me. I don't know if you can help her...and me. I want you to know that I really appreciate being given the opportunity to tell you about her...she is remarkable. She is my *heart* dog. I will miss her forever. Thanks, in advance, for your consideration. A Healing Message Soul Reading for Annie, 'The Serene Queen.' *This reading is being shared with client permission* The first thing I sensed in your reading was Ramon, popping in! And I’m going to call him ‘Ramon the Nipper!’ He does seem to be hanging about, looking out for Annie and looking forward to playing with her too. - I also see a big red (Valentine Candy) kind of heart, bigger than both of you and it is like it’s being placed over both of you. - I hear laughter, your laughter…and I can tell that it will help carry Annie over to the Other Side, when it is her time. - I suggest working with a gemstone called “Blue Topaz” for cooling and healing. Blue Topaz aids in expressing one’s emotions and needs. It promotes sharing and communication, as well as learning and mental perception. It has a calming and soothing effect on the emotional body and can facilitate the communication of one’s deepest feelings and one’s highest truth. - I see Ramon again, and he is SO impatient and excited to see Annie – he is just running all over. - I also suggest working with Angelite (Anhydrite) for help with dreaming. Angelite (Blue Druzy - light blue) aids meditation and psychic healing. It promotes empathy and compassion for all life and it calms and comforts as well as aiding oneness and the realization that we are never really alone. - Working with this stone (and the color ‘Angelic Crystal Blue’) will help make the transition smoother – you can work with this stone by placing it under your pillow and under Annie’s bedding. Jet is used to banish all negativity in order to clearly hear one’s intuition and inner light. - For Annie, you can reassure her as you are petting her, that you won’t cry, and that you are there for her – and you can tell her this telepathically as well. - At some point, she may be overly sensitive to everything and the gentler and quieter you can be, the better. - You can show her a mental image of Ramon and fields of green grass and of you there also. - If you are feeling tired or weak, I suggest working with a Yellow Citrine point – This will help energize you, so that you can be strong for the both of you – she wants to know that you will be okay. Capricorn is represented by the color blue-violet and the musical tone of “A.” Capricorn seeks integrity and to accomplish Great Works. 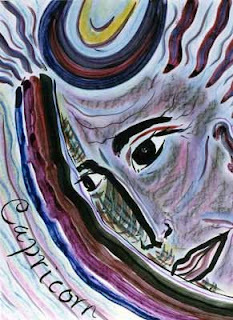 Capricorn knows all about self-discipline, common sense, logic, patience, persistence and self-sufficiency. 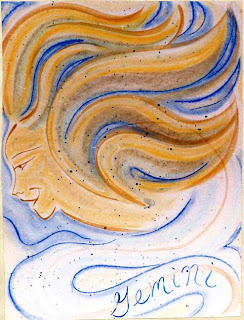 - This card reminds us that this transition is one of beauty, because change isn’t always easy, but it is necessary. Gemini Affirmation: I am a dancing, rainbow spirit: I let go easily and quickly. I communicate well and teach that skill to others. I seek the unexpected, I listen, I flood my senses with stimuli. - This Goddess will help you prepare. - Things will start to slow down (with Annie) and when she is in pain she will leave her body, she is staying around to give you time to say goodbye and when she is ready, she will tell you with a look. - You already know that only love matters and love never dies. - A little bit later, I was still meditating and thought that this reading had ended, but I came back to it again, I just knew I wasn’t quite finished with it! My Client's Response: Thank you for your email...I have so many thoughts! I am SOOOOOOO relieved and happy to know that Ramon came through. I called him Ramon the Jester because of his "out there" personality. 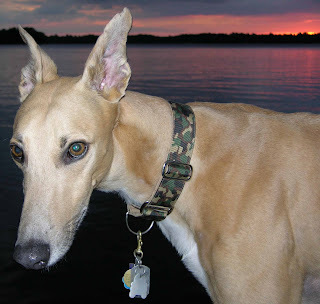 He had the biggest personality of any greyhound I have ever met!! He had a love and exuberance for life that was so beautiful! He was a big frolicking, rollicking fawn boy who adored everyone he met...and was the biggest mama's boy to me. He was my oooey goooey love muffin. Ramon was 4 years old when he died a sudden and very violent death. He and Annie and I were out walking the path skirting a wetland behind my house. He was strolling along with me and it was the loveliest Fall day. I let down my guard and, while focusing momentarily on Annie, I allowed his leash to drift out of my hand. He took a few steps away, and as I walked towards him to regain control of the leash, he walked just enough ahead of me (turning back to look at me with his teasing grin) that I could not ever get to him. At one point, he turned away from me and bolted down the path and up onto a road. Annie and I ran screaming for him to stop. Before we reached to top of the path, I heard a big thump and one sharp cry. He had made it across the street but on the way back to me he was struck by a car. He was standing by the side of the road when I got to him. I put my arms around him and started feeling for injuries but he was physically perfect. Within moments, he collapsed down and I wrapped my coat around him. The man who hit him agreed to take us to my vet hospital and I sat in the backseat with Ramon in my arms. Annie was in the front seat...but she climbed into the back and laid on top of him with her face by his face. During the ride, he started gasping and as we pulled into the parking lot Ramon took his last breath. He died from severe internal bleeding. He is home with me now, in a beautiful urn. I want him here. I have always been troubled by the fact that Ramon has never come to me. I have never felt his presence and I have never seen him in a dream. I always wondered if the trauma of his death...and the fact that I didn't protect him from it...played a role. 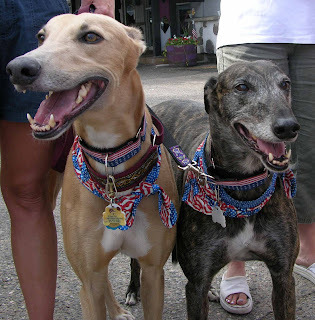 I will never forgive myself for squandering the greyt gift that i had been given. I was charged with protecting him and I failed. To know that he surrounds Annie and will be there for her is so comforting...I can't tell you. And to know that he is still his jubilant self makes me smile through my tears. Annie had a very peaceful night last night. She seemed calm and comfortable...and that is not always the case. This morning, while walking, she even trotted a little...slowly...but did her little "head shake" that always indicates that she is so happy! She is resting now after her breakfast. I will take your suggestions to heart....and work very hard to try to put my grief aside when working with her. As I told you..Annie is my *heart* dog. Ramon was my *soulmate*. I love the image of a big heart encompassing us. It's beautiful. Thank you, Kathy, for all of your kindness and intuitive insights. I will be forever grateful to you. You can book a Healing Message Reading here - http://www.KathyCrabbe.com To see more Sample Readings please click here.